When Living Thing came out in 2009, I was riding high on a perception of Peter Bjorn and John that was built around catchy soft-pop loaded with memorable whistles, guest vocalists, delicate guitars and sincere, emotionally open lyrics. Of course, I garnered those expectations from listening to 2006's Writer's Block, an album that so succinctly capture the indie-pop sensibility that it exploded into popularity. Living Thing was nothing like its predecessor. It was tinny, mechanical, crass and robotic. What happened to my whistles and acoustic guitars? In fact, I was so surprised (really, at the time, disappointed) with the album that I chose not to review it. I barely listened to it for weeks after I picked it up. I was disillusioned. But with time, I started to get it, which is an event that played strongly into the ideology of Gas Lantern Media. Essentially, Living Thing was one of those times that I forced myself to hear the project, rather than try to find the band I thought I loved inside it. Once I did that, I realized that Living Thing was a play. It was about the contrast of death and life, the contrast of acoustic and mechanic/electric, and the concept that musical expression doesn't just plop down one day, deciding that its past success ought to dictate all of its future production. And it's that moment that informs my view of Peter Bjorn and John's newest Gimme Some. 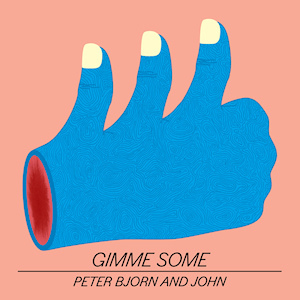 Fans of PBJ who jumped the bandwagon specifically because of "Young Folks" and its catchy, damn near perfect melody will be pleased with Gimme Some. The new album stresses catchy riffs and hooks over rampant experimentation. But now, the music is more strongly suffused with electric guitars, resulting in a less delicate sound that works in subtle and effective contrast to the once more sincere lyrics. Gimme Some runs back to the emotional zone of break ups, quarter-life crisis, boredom and all that stuff we love when we are those things, or at least as long as we remember that we were or are on the bottom line of our experience. And Gimme Some dishes out pop excellence like a deck of cards. The only thing this new album doesn't do is give out that same anthem that we got from Writer's Block. But bands AREN'T made of anthems, as my father used to say whenever I asked for additional allowance. Songs like "Tomorrow Has to Wait" and "Second Chance" are up there in the old brainworm stuck in the head territory. Both songs are brilliant, but also more like a dance-rock fusion (with some tasty cowbell) than the "original" impression we got from PBJ here in the States. There's a lot of diversity here too, like the surf-rock-ish "Eyes" and "Breaker Breaker," both of which burst with energy and a strange disdain. Peter Bjorn and John are no longer trading entirely in pretty, but they're still trading in great. And the balance of pace and timing, along with offering some more clattering tunes mixed with softer, more haunting stuff ("May Seem Macabre" is a good example, but one with a stellar bass line that overwhelms any sense of dreariness) works so well that this may well turn into the favorite Peter Bjorn and John album of the three I've discussed here. This band is ceaselessly reinventive, something that many bands need long hiatuses to pull off this well, and Gimme Some is evidence that these boys from Sweden are not above bringing fun tunes back. Their audience, including me, just needs to learn that they probably won't sound the same next time, either. The album is streaming live through NPR's First Listen, just click on this here sentence to hop right there. And for god's sake, support public radio and all the national media outlets that can do amazing stuff like this and provide a good summation, too. It beats a message board where someone bleats illiterate text messages at your computer screen.